“Starship Troopers” RiffTrax brings back Mystery Science Theater Laughs! I have so many great memories in my life; many stemming from cheesy monster movies. As a kid I was glued to the television set every Saturday afternoon for the CREATURE DOUBLE FEATURE and as an adult, I was glued to the television set every Saturday night for MYSTERY SCIENCE THEATER 3000! It was such a disappointment when Comedy Central cancelled MST3K and the SyFy Channel picked it up. Like all good things, the SyFy Channel usually ruins it. Thankfully it wasn’t long before the guys who made a career out of riffing on movies, something many of us did anyway, went on to create CINEMA TITANIC, THE FILM CREW and RIFFTRAX, all variations of the original concept. As of this writing, to my knowledge, RIFFTRAX is the only remaining of the three projects and it stars MST3K alums Michael J. Nelson, Kevin Murphy and Bill Corbett. 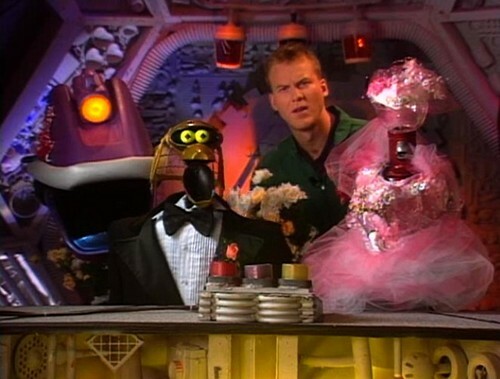 They pretty much do the same thing that either Joel or Mike did with Crow T. Robot and Tom Servo, but only now they do it live on stage in front of a packed audience of MST3K fans. I have seen many of their DVD releases and at times, their live show is broadcast nationally at local movie theaters, usually showing the public domain films we are all accustomed to. 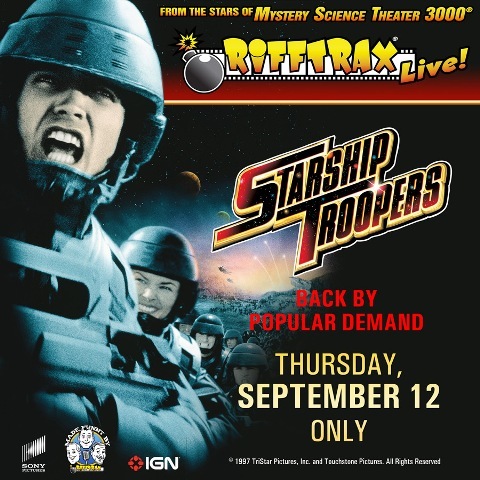 Just recently, however, RIFFTRAX presented somewhat of a blockbuster film (by their standards) to be riffed on, STARSHIP TROOPERS, from 1997. This was with the help of a kick-starter program and this presentation (shown LIVE a month ago) was an encore. 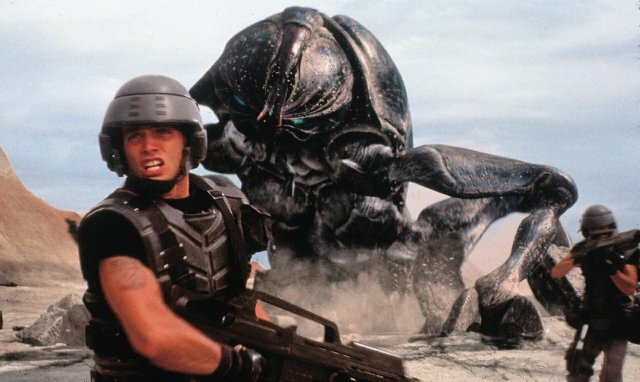 STARSHIP TROOPERS got mixed reviews at the time of its release but to me it was a fun and exciting movie. It featured a great cast including Casper Van Dien, Denise Richards, Dina Meyer, Neil Patrick Harris and Jake Busey (many of whom supported the kick-starter program). The story was also very well put together with amazing special effects, including some of the best CGI effects ever put to film. When it was announced that this great sci-fi films was going to be the target of riffing, I had no idea what to expect. Thankfully, Mike, Kevin and Bill did not disappoint. They took an already great film and made it even greater! The jokes throughout were fast and furious and there were many nods to the MST3K days, that only devout fans would get. No one was spared their wrath, especially Denise Richard, who set up their jokes thanks to the blank stare she always seems to have going on. I truly love seeing these presentations because they are always a guaranteed good time and the people who are in the audience with you are people who actually get it. To this day I still have people who say they hated MST3K because when they watch a movie, they don’t want people talking through it. They clearly didn’t get it. It makes for a much greater viewing experience when you are surrounded by people who are laughing at the very same thing you are laughing at and who truly appreciate what these three comic geniuses are all about. 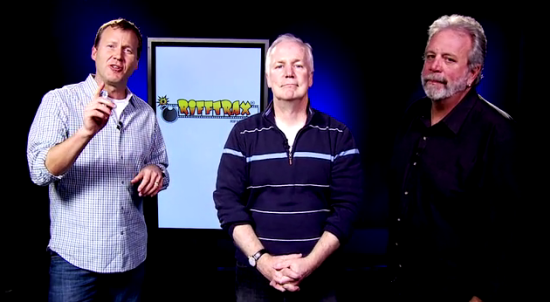 If RIFFTRAX ever comes to a city near you, make sure you check it out! You will be glad you did (and you will probably find yourself pulling out those circulated tapes of yesteryear to relive the magic that was MYSTERY SCIENCE THEATER 3000)! This entry was posted in Horror Hosts, Science Fiction and tagged Bill Corbett, Casper Van Dien, Creature Double Feature, Crow T. Robot, Denise Richards, Dina Meyer, Jake Busey, Kevin Murphy, Michael J. Nelson, MST3K, Mystery Science Theater 3000, Neil Patrick Harris, Rifftrax, Starship Troopers, SyFy Channel, Tom Servo. Bookmark the permalink. ← Delving into the Dynamics of Svengoolie’s New Coffin! My husband and I were at the August showing and had a blast! It was hilarious. We can’t wait for Rifftrax Live: Night of the Living Dead next month on the 24th.